Pain is a long-standing problem of epidemic proportions in America, with 83 million adults living with pain that affects their participation in daily activities, and 75 million people with chronic debilitating pain. Treatments most often prescribed by physicians include pain medicinesnarcotic and non-narcotic, physical therapy, and surgery. Studies show that many people have endured years of agony and have undergone two or more failed surgeries seeking pain relief. Furthermore, 4.5 million patients die in pain each year, and 26% of nursing home residents experience pain daily. Pain can be described according to its cause (malignant or non-cancer), physiologic description (neuropathic, visceral, or somatic), and/or temporality (acute or chronic). The distinction between acute and chronic pain is no longer considered primarily a function of how long the pain lasts. Instead, acute pain is described as pain that usually has an identifiable pathology and predictable prognosis. Examples of acute pain are a sprained ankle or ear infection. These types of pain usually resolve once treated and healed. Chronic pain, on the other hand, is generally of unclear pathology and unpredictable prognosis, and can be caused by countless diseases, syndromes, injuries, or surgeries. Chronic pain tends to last longer than six monthsbeyond the expected course of healing. Chronic pain negatively impacts all aspects of an individual's life, including emotional, vocational, financial and social elements. The entire family may be dramatically affected, and many feel isolated because they can no longer work or must drop out of their normal activities, thus further isolating themselves from friends and family. While more than 80% of all physician visits are for chronic pain, the majority of health care providers have little or no training specific to pain medicine and management. Pain costs the nation an estimated $100 billion annually in medical claims, disability payments and lost productivity. In an effort to improve on these shortcomings, the Joint Commission on Accreditation of Healthcare Organizations (JCAHO) issued guidelines in their 2000-2001 Standards Manual that recommend screening for the presence of pain, assessing its nature and intensity, keeping records of assessment so that follow-up can be performed, and establishing procedures to provide appropriate medication to patients in pain. Various approaches have been tried to encourage patients and healthcare providers to talk about pain and to allow for adequate treatment. Despite these efforts to publicize proper pain management, under-treatment continues. Practitioners and even patients still view pain as something they must learn to live with. Providers may fail to assess pain routinely or accurately. Clinicians are often fearful of patient addiction to narcotics and sometimes prescribe inadequate doses and/or inappropriate drugs. Some health care providers believe that a patient’s increasing requests for pain medication indicate a tolerance to these drugs instead of unrelieved pain. Clinicians are concerned about possible disciplinary action by regulatory authorities monitoring prescribing of controlled narcotics. A key factor in the underassessment of pain is that sometimes patients do not report their pain. Patients may believe that pain is a normal part of aging or that good patients do not complain. They also may be concerned about adverse effects and addiction. Lastly, patients often fear that if they acknowledge they are in pain, there will be financial or occupational consequences. These patient factors are in part attributable to inadequate patient education. Despite the physical and financial toll, millions of people continue to suffer needlessly, unaware of effective pain-management options. The goals of an appropriate pain management program should be to decrease pain and suffering, improve physical and mental functioning, and to ensure improved quality of life. Patients have sought out non-conventional treatments when conventional medicine failed, and the recent attention on improving pain in America has placed an even greater emphasis on alternative and complementary modalities in the field of pain medicine. Today, the approach most pain management programs embrace is to respect pain, treat it intensively, address the patient's psyche, and to adopt an integrative multidisciplinary approach, incorporating the following: patient education, medications, physical therapies, relaxation techniques, psychosocial counseling, surgical procedures, injection techniques, various alternative medicine modalities. Current Analgesic Options: Optimizing Pain Management. University of Wisconsin Medical School, the University of Connecticut School of Pharmacy, and PharmaWrite. Berry PH, Dahl JL. Making pain assessment and management a healthcare priority through the new JCAHO pain standards. J Pharm Care Pain Symptom Control. 2000; 8: 5-20. Dahl JL. Improving the practice of pain manageent. JAMA. 2000; 284: 2785. Foley K. Dismantling the barriers: Providing palliative and pain care. JAMA. 2000; 283: 115. Gureje O, Von Korff M, Simon GE, Gater R. Persistent pain and well-being. A world health organization study in primary care. JAMA. 1998; 280: 147-151. Ward SE, Goldberg N, Miller-MccCauley V, et al. Patient-related barriers to management of cancer pain. Pain. 1993; 52: 319-324. Weinstein SM, Laux LF, Thornby JI, et al. Physicians attitudes toward pain and the use of opioid analgesics: results of a survey from the Texas cancer pain initiative. South Med J. 2000; 93: 479-487. Won A, Lapane K, Gambassi G, Bernabei R, Mor V, Lipsitz LA. Correlates and management of nonmalignant pain in the nursing home. J Am Geriatr Soc. 1999; 47: 936-942. NOTE: The following resource listings are not intended to be comprehensive, nor to be used as a guide for treatment. They are provided for information only. The resources are selected and categorized to help you with your own research. Dr. Dillard, director of Complementary Medicine Services at the University Pain Center in Manhattan offers this comprehensive guide to understanding chronic pain and available alternative and conventional medicine treatments. He includes a discussion on how to find a pain specialist, and information on children, pregnant, elderly, or terminally ill. The author is president of the American Academy of Pain Medicine who writes about an interdisciplinary chronic pain-management approach that integrates conventional and alternative techniques, including pharmacology, neuroscience, experimental procedures, and mind-body medicine. Written by physicians at the Mayo Clinic, this book is a comprehensive resource on managing chronic pain and living an active and productive lifestyle. Topics include causes of chronic pain, exercises, pain medications, support, alternative therapies, new techniques, and goals. The author is a pain and addiction medicine specialist who provides a thorough guide to pharmaceutical therapies, non-drug alternatives, and a frank discussion on opioids. A unique section in the book focuses on how personality may affect one’s ability to cope with chronic pain and tips on how to overcome this. Dr. Caudill has developed a program from her experience as a pain specialist that focuses on teaching chronic pain sufferers how to cope with their pain. She discusses mind-body techniques, exercises, diet modifications and pain medications. This book offers a narrative of Dr. Cochran's over 40 years of experience in treating his patients suffering from chronic pain. These case studies may help readers gain a greater understanding of the mind-body role in pain. A Board Certified Chiropractic Neurologist, Dr. Johnson presents case histories of actual patients, details specific examination procedures to provide an in-depth diagnosis of each condition, precise explanations of the treatments used, and explanations of how chronic conditions originate. Dr. Marcus has established and directed several pain clinics, writes about his narcotics-free pain treatment program, used at Lenox Hill Hospital. 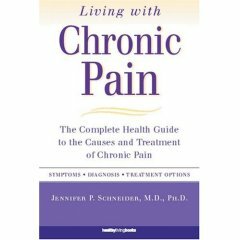 Included are patient histories, illustrating how body awareness, exercise, and coping and relaxation techniques can be used to control and reduce the devastating effects of chronic pain. Provides the latest information on evaluating alternative therapies and integrating them into clinical practice. Publishes several articles on therapies for chronic pain. A bimonthly clinical research journal with particular emphasis on mind/body approaches to wellness; has occasional articles on pain. The official peer-reviewed journal of the American Academy of Pain Management, serves as a vehicle for the transmission of knowledge related to the study and practice of pain management. Promotes an appreciation of the interdisciplinary, multi-modal approach to pain care. The Annals is the official journal of the American College of Physicians. Search the Annals for abstracts and full text articles on chronic pain and alternative therapies. The official publication of the Eastern Pain Association, this journal explores all aspects of pain and its effective multi-disciplinary treatmentboth conventional and complementary. Articles cover a variety of topics, including clinical dilemmas in pain management; diagnostic procedures; new pharmacological, surgical and other therapeutic modalities; and the psychosocial and ethical issues of concern to all medical professionals involved in pain medicine and management. Often includes CAM articles. This peer-reviewed journal includes clinical trials, observational and analytical reports on treatments outside the realm of allopathic medicine. It includes current concepts in clinical care, including that for chronic pain, for health care professionals and scientists seeking to evaluate and integrate these therapies into patient care protocols and research strategies. This is the official scientific publication of the American Osteopathic Association, as well as the scholarly peer-reviewed publication of the osteopathic medical profession. Provides free access to full-text articles, many on chronic pain. This journal publishes original articles related to all aspects of pain, including clinical and basic research, patient care, education, and health policy. This peer-reviewed journal provides the professional with the results of important new research and clinical information related to pain management and palliative care. The official publication of the International Association for the Study of Pain, publishing original research on the nature, mechanisms and treatment of pain. The official journal of the American Academy of Pain Medicine is a multi-disciplinary journal dedicated to the advancement of pain management, education and research. Frequently publishes CAM articles. Bandolier is a journal of evidence-based medicine. The above link lists articles from a systematic review of pain. A summary of several alternative therapies often used as an adjunct to conventional pain management, including a description of the technique, what it is used for, and evidential support. Complementary Therapies in Medicine, October 11, 2005. Volume 13: 244-250. Investigates the possible effects of a combined spa and physical therapy program on pain and hemodynamic responses in various chronic diseases. Journal of Alternative and Complementary Medicine, June 2005, Volume 11 (3): 495-509. A systematic literature review of whether there is evidence for or against the efficacy of static magnets to produce analgesia. Conclusion suggested evidence of analgesic effect. A Continuing Medical Education article that discusses inflammation as the underlying basis of a number of diseases. Evidence shows that lifestyle changes can significantly affect the inflammatory process and potentially help people live longer, healthier lives. An overview of the physiology of pain, why people pursue complementary or alternative care, and an evidence-based description of how osteopathic manipulation can improve chronic pain. E. Manheimer, M.S., A. White, M.D., B. Berman, M.D., K. Forys, M.A., and E. Ernst, M.D. Annals of Internal Medicine, April 19, 2005, Volume 142 (8): 651-663. A review of randomized, controlled trials evaluating acupuncture’s effectiveness for treating low back pain found acupuncture effectively relieves low back pain. Nonmalignant, chronic pain is associated with physical, emotional and financial disability. Treatment of chronic pain involves a comprehensive approach using medication and functional rehabilitation. The Journal of the American Osteopathic Association, November 2004, Volume 104 (11): 6-12. A review of peer-reviewed medical literature on the nonpharmacologic management of chronic pain supports the use of manipulation and mobilization, exercise, psychological intervention. A systematic review and meta-analysis of the efficacy of selected CAM therapies for pain from arthritis and related conditions (acupuncture, homeopathy, herbal remedies, and selected nutritional supplements), shows there is evidential support for some therapies, but a need for additional high quality research for other therapies, especially for herbals and homeopathy. A non-profit, inclusive, interdisciplinary organization serving clinicians who treat people with pain through education, setting standards of care, and advocacy. Also provides credentialing, accreditation of facilities, networking opportunities, continuing education, quality publications and an annual clinical meeting. Patients can search the website for practitioners, clinics, and access conventional and complementary treatment web links. The AAPM is the medical specialty society representing physicians practicing in pain medicine, and is involved in education, training, advocacy, and research. The AAPM represents the multi-disciplinary approach of this field and embraces its diverse scope in its memberships of practitioners from various medical disciplines. The national medical society for physiatrists, who are physicians specializing in restoring function for those with acute and chronic pain, musculoskeletal problems, traumatic pain and more. This website provides general information on PMR medicine, the conditions it may be useful in treating, and a physician directory, categorized by state. The IASP is an international non-profit multi-disciplinary organization dedicated to furthering research on pain and improving the care of patients with pain. This website provides an extensive listing of web resources from the USA and 25 other countries. Although partially funded by corporate sponsorships, the ACPA is a non-profit organization that supports and provides information for people with chronic pain and their families. The ACPA focuses on general information for patients and healthcare providers with mostly conventional resource links. A non-profit organization that is partially funded by corporate sponsors which serves people with pain through information, advocacy, and support. Goals include improving the quality of life of people with pain by raising public awareness, providing practical information, promoting research, and advocating increased access to effective pain management. Click on Useful Links About Pain to access web resources for Complementary and Alternative Medicine. iSTOP is a non-profit organization dedicated to understanding and treatment of soft tissue pain. The doctors and physical therapists at the iSTOP clinic are trained in Intramuscular Stimulation (IMS) to treat soft tissue pain. IMS involves dry needling with acupuncture needles in affected areas of the body to release "muscle shortening", thereby treating underlying pain. Funded partially by corporate sponsorships, the NPF is a non-profit organization established to advance functional recovery of persons in pain. The NPF provides a virtual community for pain patients, their families and friends, offering an interactive medium for peer-reviewed information and resources. They explore both conventional and complementary approaches to pain management. See also the Professional Organizations section for links to provider directories. Dedicated to serving the rehabilitation and intervention needs of people with acute or chronic long-term pain, the department provides comprehensive specialized care with an interdisciplinary team approach. This center consists of a multi-disciplinary group of professionals dedicated to alleviating pain through a comprehensive medical and behavioral approach. Services offered are medical management, acupuncture, energy work, musculoskeletal treatments, percutaneous electrical nerve stimulation, biofeedback, stress management, and many more conventional and alternative therapies. The center also has an inpatient acute service and pediatric pain service. This center offers a 21-day integrative program that focuses on helping people manage chronic pain so they can be restored to a lifestyle of comfortable function and mobility. A holistic approach is used to focus on the patient’s personal goals. The following methods are used: biofeedback, medication management, stress management, physical therapy and fitness, soft tissue mobilization, manual medicine, and relaxation techniques. The center also offers single-service therapies on an outpatient basis for people with acute or subacute pain. This article provides an overview of specialized pain treatment, how to find a clinic, and what to think about before choosing a facility. This center offers pain relief programs that integrate several approaches to address the behavioral, emotional, spiritual and physical dimensions of pain. Personalized pain management programs may include: psychosocial evaluation, stress management, and 8-week comprehensive integrative pain management program, acupuncture, biofeedback, massage therapy, spirituality classes and much more. This organization is from the Beth Israel Medical Center Department of Pain Medicine & Palliative Care, which is part of a non-profit hospital system in New York City. Click on pain medicine to learn about common chronic pain disorders, integrative treatment strategies, prescription and non-prescription medications, and new innovations in pain research. Click on Clinical Trials for further links to trials conducted at Beth Israel and beyond. The Pain Management Center has offered comprehensive therapies for nearly thirty years for a variety of pain syndromes. The center offers an acute care team and a chronic pain treatment team. Clinical research and education are ongoing integral parts of the center. This site offers patient care from specialists in Integrative Medicine in an environment supported by the University of Maryland Integrative Medicine research program, providing patients with individualized treatment options. Chronic pain therapies offered include acupuncture, craniosacral therapy, homeopathy, mind/body therapies, reflexology, stress management, and more. This center is a National Institutes of Health Center of Excellence for Research in Complementary and Alternative Medicine. This site is a service of the U.S. National Library of Medicine and the National Institutes of Health. Features a variety of topics on pain, including alternative therapies. Use this site to find information about clinical research, including listings of more than 41,000 active industry and government-sponsored clinical trials, as well as new drug therapies in research and those recently approved by the FDA. This site is a service of the U.S. National Institutes of Health and developed by the National Library of Medicine. It provides regularly updated information about federally and privately supported clinical research in human volunteers. ClinicalTrials.gov gives you information about a trial's purpose, who may participate, locations, and phone numbers for more details. The information provided on ClinicalTrials.gov should be used in conjunction with advice from health care professionals. Bandolier is a journal of evidence-based medicine. This website focuses on systematic reviews with pain as an outcome, including downloadable articles and numerous links to other pain-specific topics. A forum for people living with chronic pain to seek support through chat rooms and message board. A listing of conventional and alternative medicine Internet resources for general and specific types of pain. This educational and informational Internet source for pain practitioners and patients, provides directories for support groups, pain clinics, and various other resources. Although this site is supported by pharmaceutical companies, there are several links to organizations and sites that are focused on alternative medicine. A listing of accredited pain management clinics. American WholeHealth Networks' Complementary and Alternative Medicine (CAM) education website. The site is dedicated to providing integrative health and wellness solutions by combining the resources of both scientific health research and CAM. Click on specific health issues for information on conventional medicine, alternative therapies, supplements, lifestyle options, and much more.